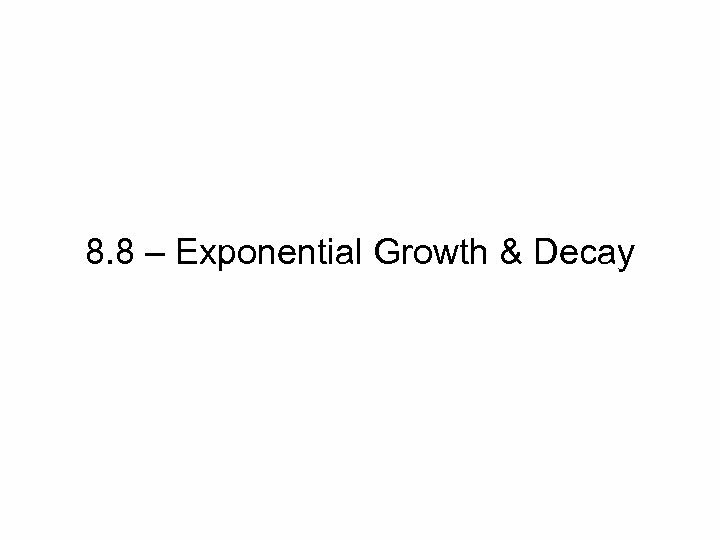 Decay: 1. 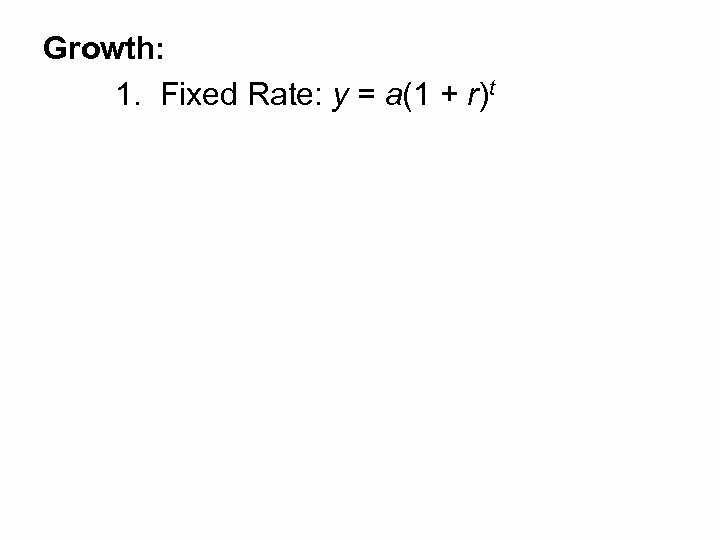 Fixed rate: y = a(1 – r)t where a = original amount r = rate of decrease t = time y = new amount Ex. 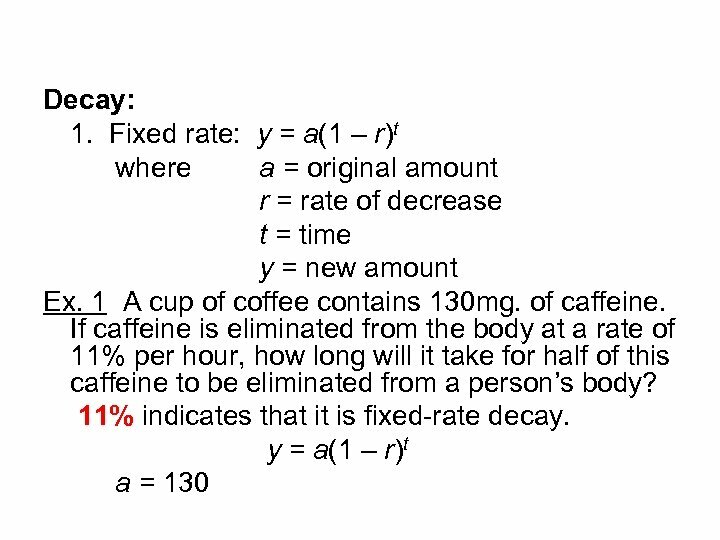 1 A cup of coffee contains 130 mg. of caffeine. 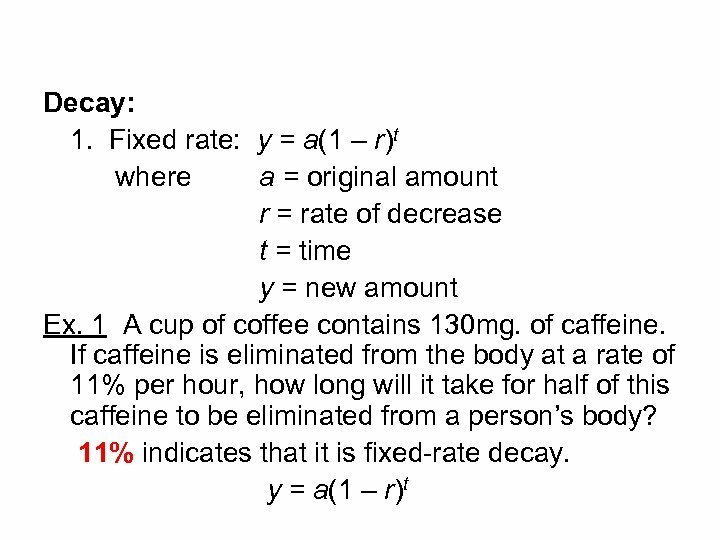 If caffeine is eliminated from the body at a rate of 11% per hour, how long will it take for half of this caffeine to be eliminated from a person’s body? Decay: 1. Fixed rate: y = a(1 – r)t where a = original amount r = rate of decrease t = time y = new amount Ex. 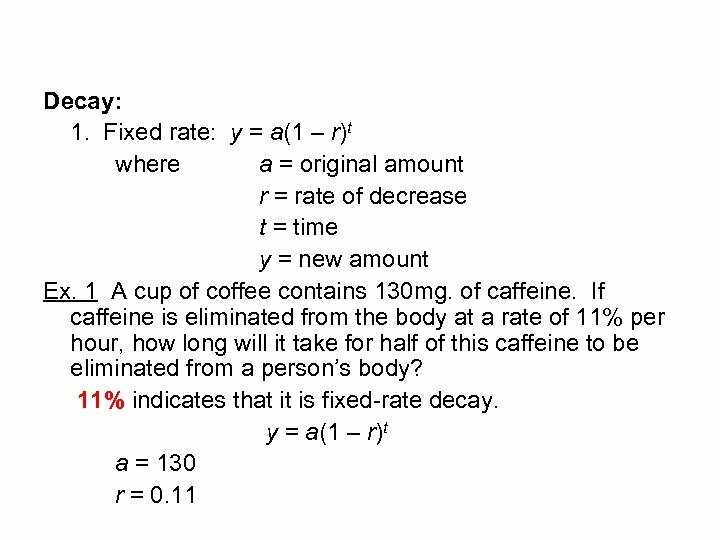 1 A cup of coffee contains 130 mg. of caffeine. If caffeine is eliminated from the body at a rate of 11% per hour, how long will it take for half of this caffeine to be eliminated from a person’s body? 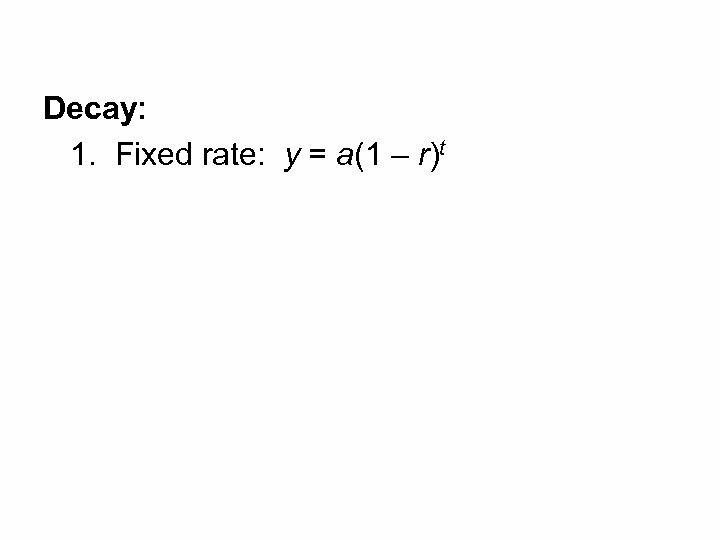 11% indicates that it is fixed-rate decay. Decay: 1. 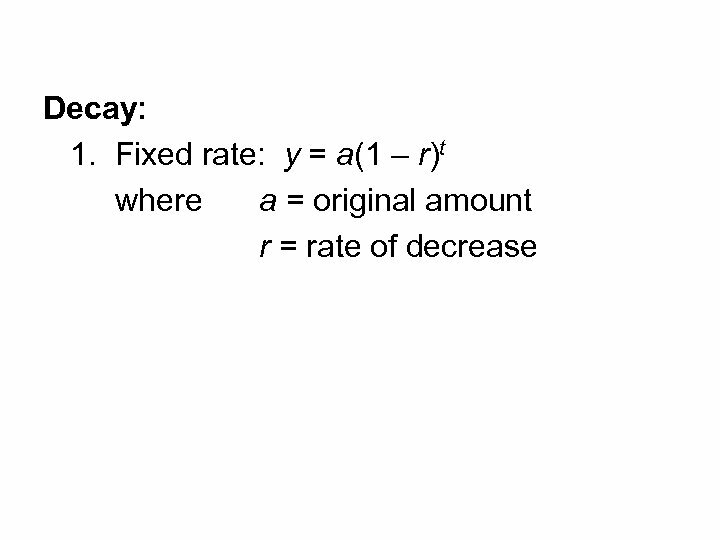 Fixed rate: y = a(1 – r)t where a = original amount r = rate of decrease t = time y = new amount Ex. 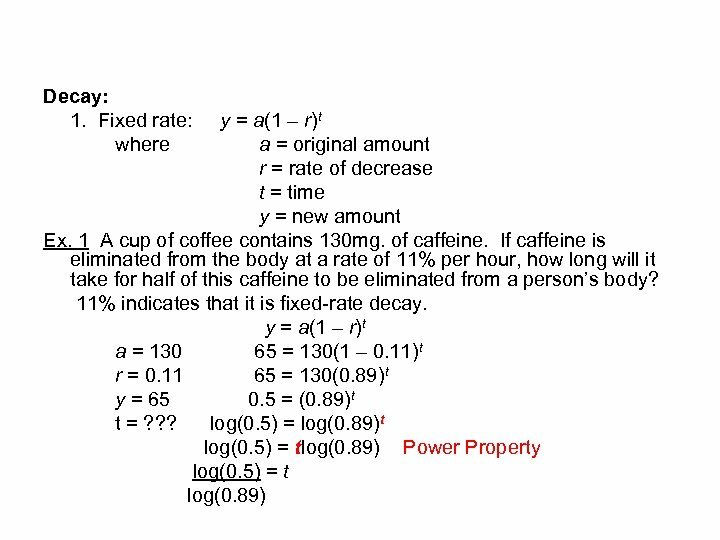 1 A cup of coffee contains 130 mg. of caffeine. If caffeine is eliminated from the body at a rate of 11% per hour, how long will it take for half of this caffeine to be eliminated from a person’s body? 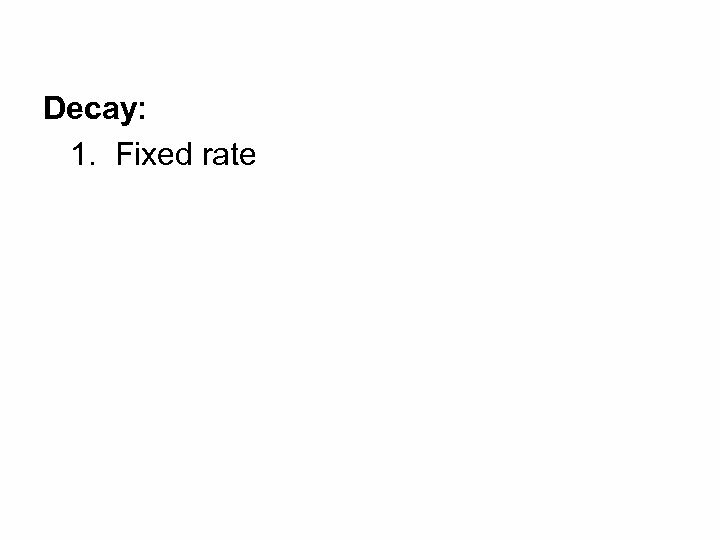 11% indicates that it is fixed-rate decay. y = a(1 – r)t a = 130 r = 0. 11 y = 65 t = ? ? ? 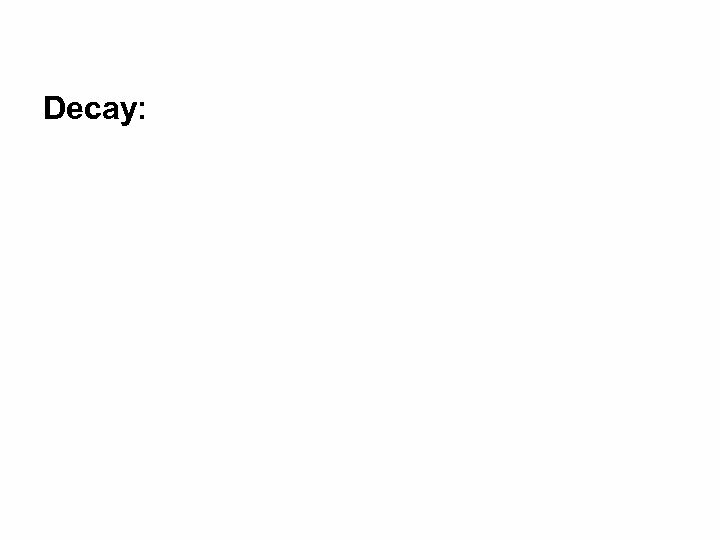 Decay: 1. 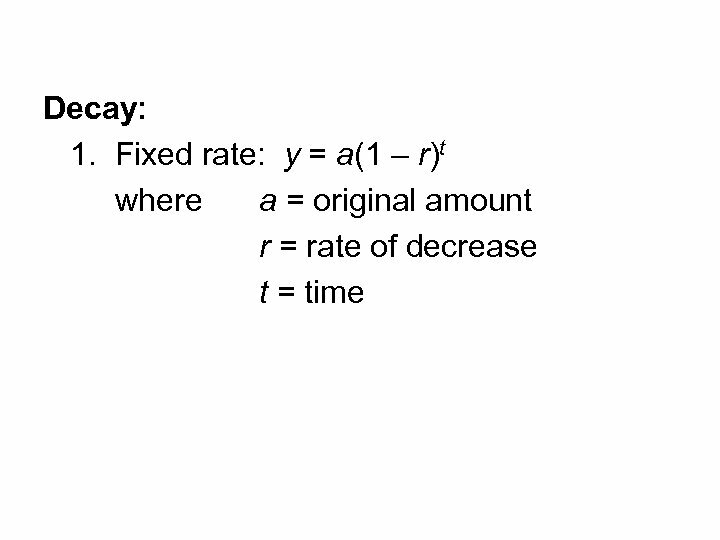 Fixed rate: y = a(1 – r)t where a = original amount r = rate of decrease t = time y = new amount Ex. 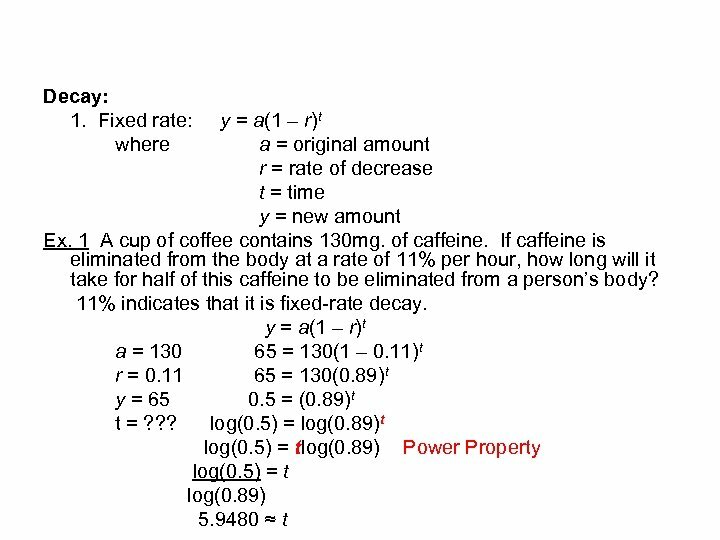 1 A cup of coffee contains 130 mg. of caffeine. 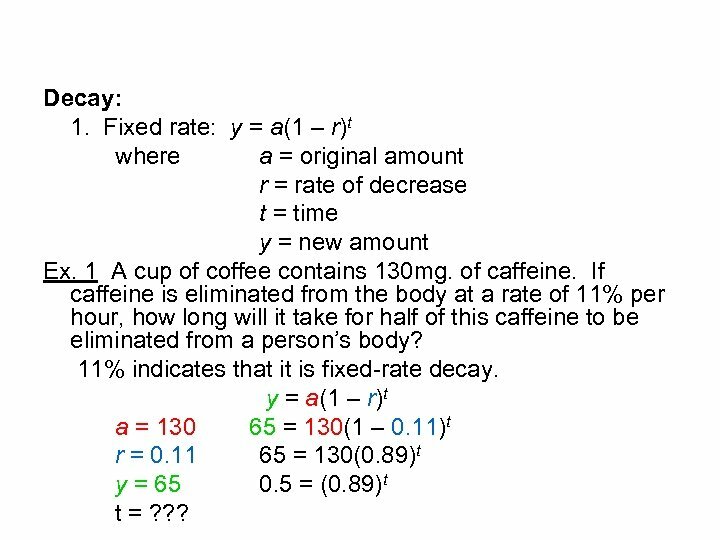 If caffeine is eliminated from the body at a rate of 11% per hour, how long will it take for half of this caffeine to be eliminated from a person’s body? 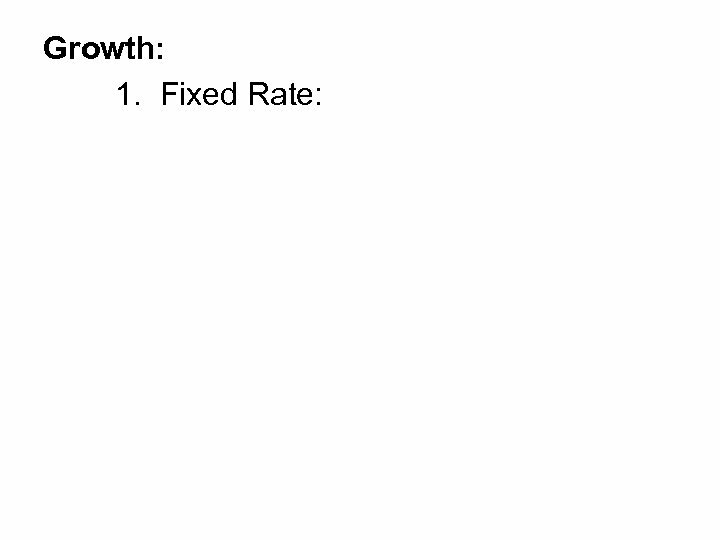 11% indicates that it is fixed-rate decay. y = a(1 – r)t a = 130 65 = 130(1 – 0. 11)t r = 0. 11 y = 65 t = ? ? ? Decay: 1. 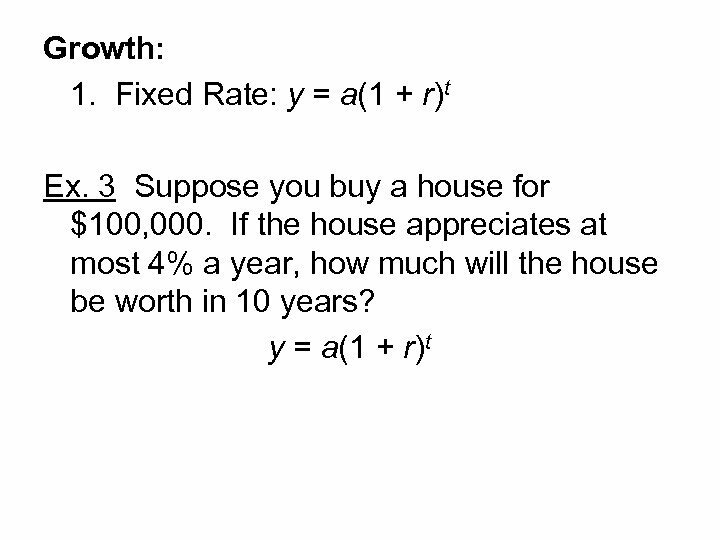 Fixed rate: y = a(1 – r)t where a = original amount r = rate of decrease t = time y = new amount Ex. 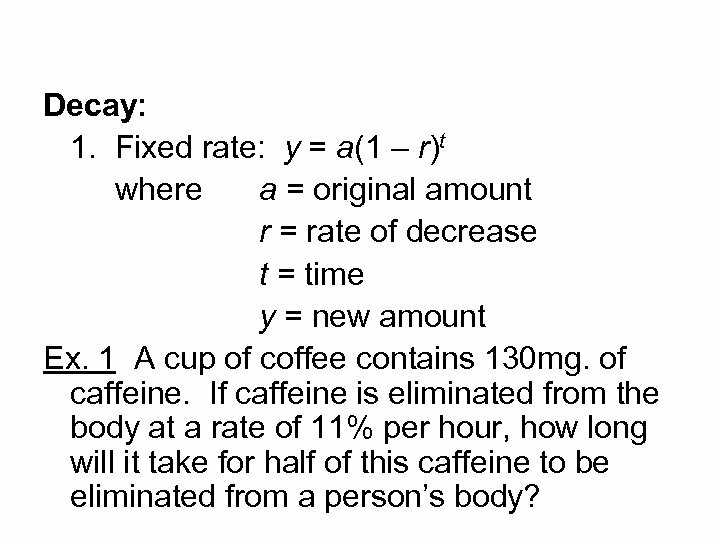 1 A cup of coffee contains 130 mg. of caffeine. 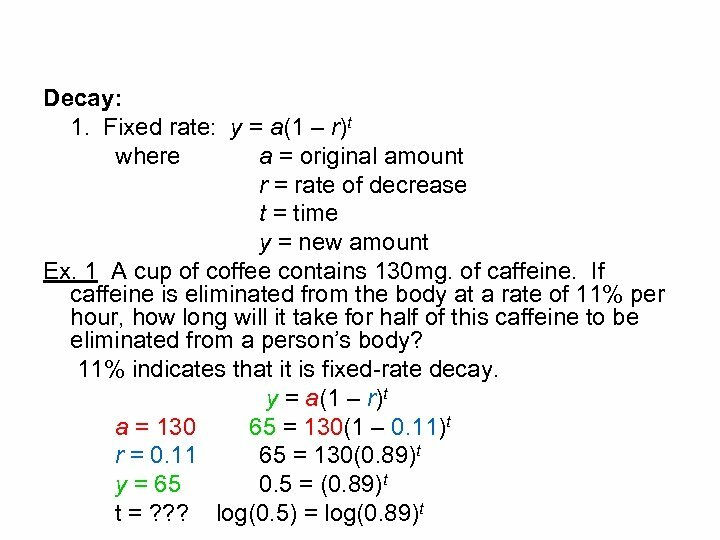 If caffeine is eliminated from the body at a rate of 11% per hour, how long will it take for half of this caffeine to be eliminated from a person’s body? 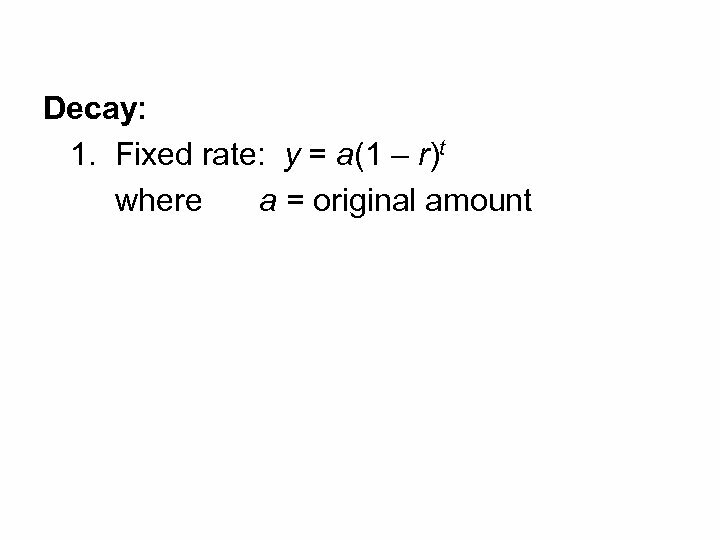 11% indicates that it is fixed-rate decay. y = a(1 – r)t a = 130 65 = 130(1 – 0. 11)t r = 0. 11 65 = 130(0. 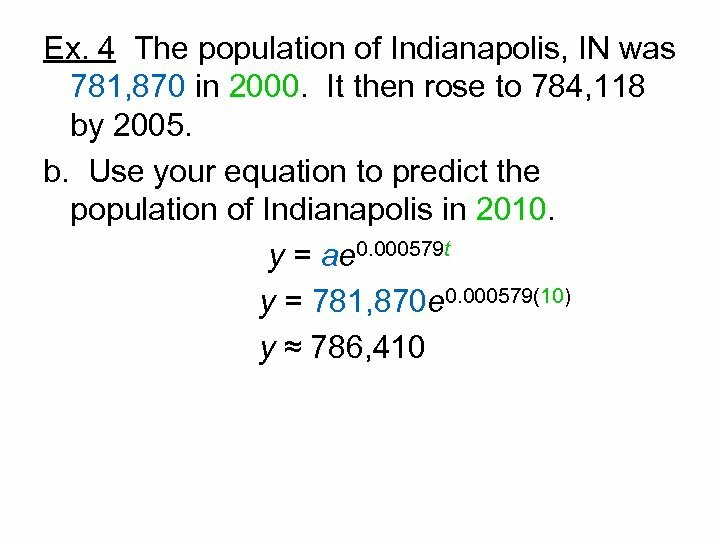 89)t y = 65 t = ? ? ? Decay: 1. Fixed rate: y = a(1 – r)t where a = original amount r = rate of decrease t = time y = new amount Ex. 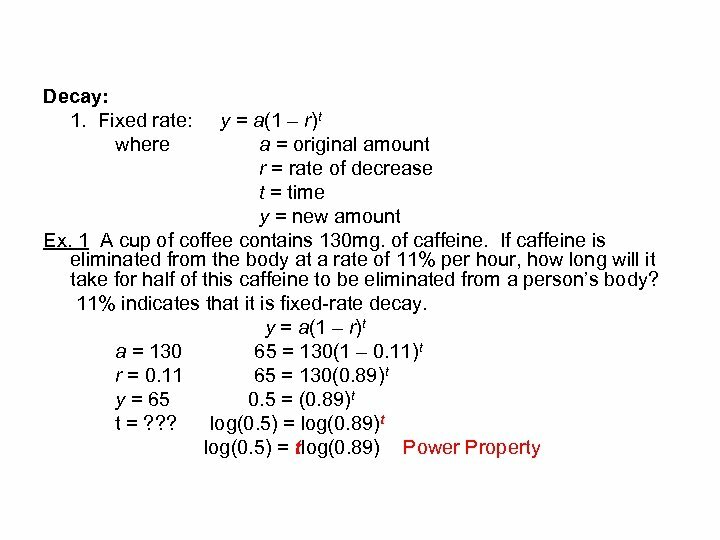 1 A cup of coffee contains 130 mg. of caffeine. 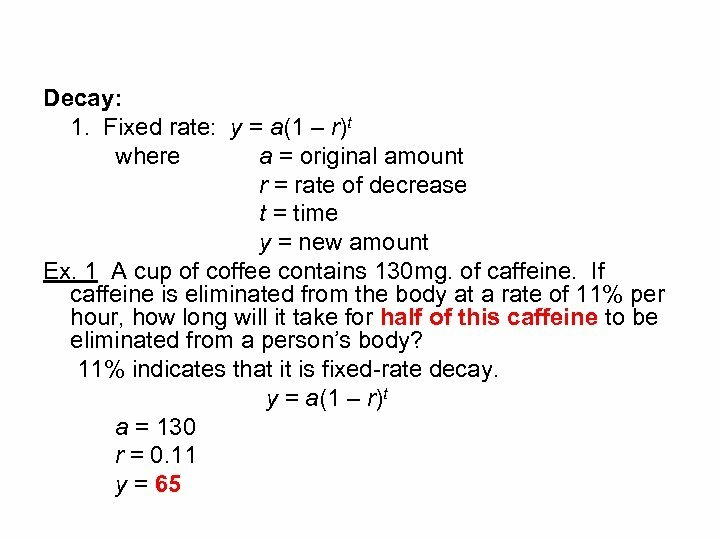 If caffeine is eliminated from the body at a rate of 11% per hour, how long will it take for half of this caffeine to be eliminated from a person’s body? 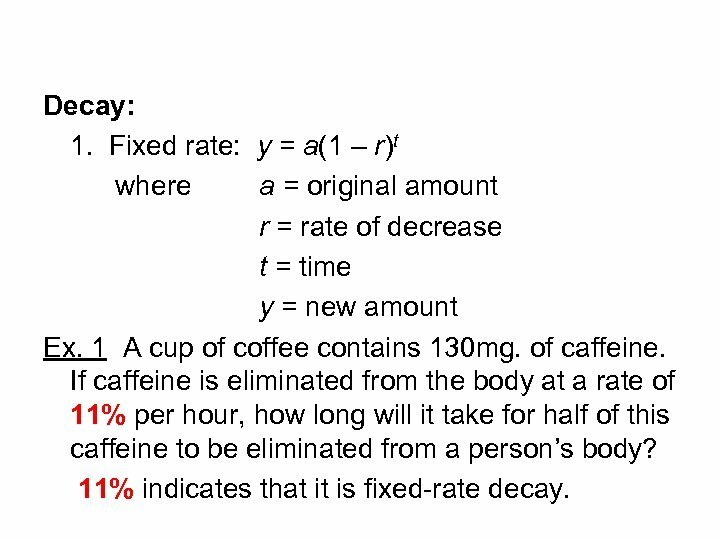 11% indicates that it is fixed-rate decay. y = a(1 – r)t a = 130 65 = 130(1 – 0. 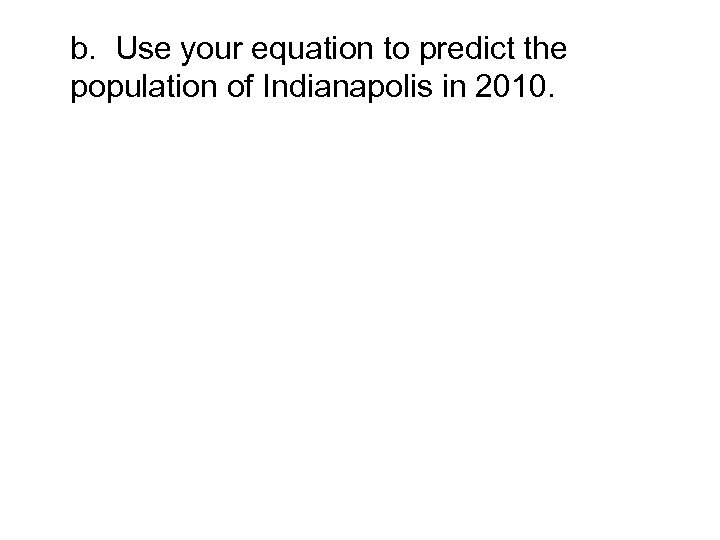 11)t r = 0. 11 65 = 130(0. 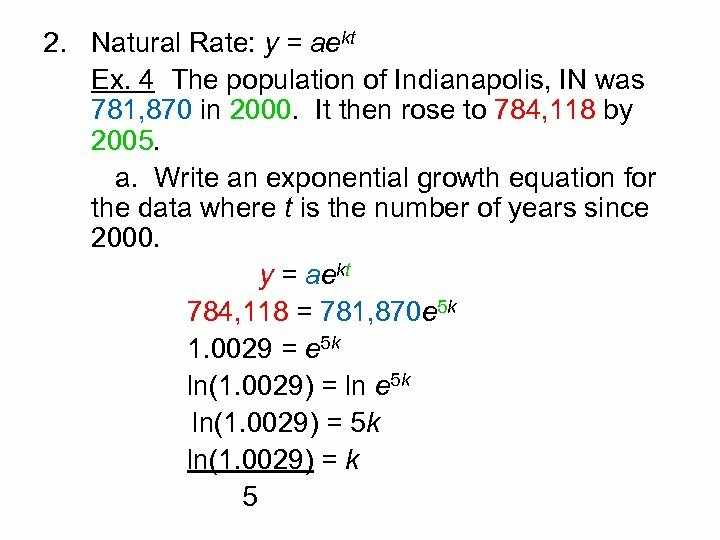 89)t y = 65 0. 5 = (0. 89)t t = ? ? ? 2. Natural rate: y = ae-kt a = original amount k = constant of variation t = time y = new amount Ex. 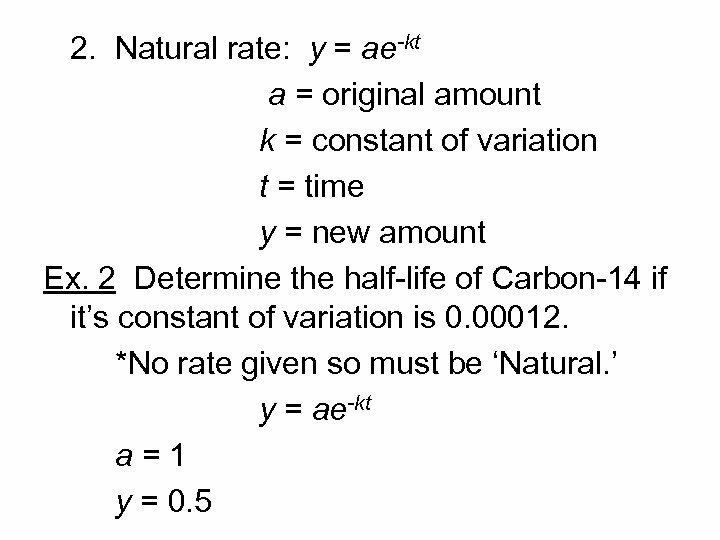 2 Determine the half-life of Carbon-14 if it’s constant of variation is 0. 00012. 2. 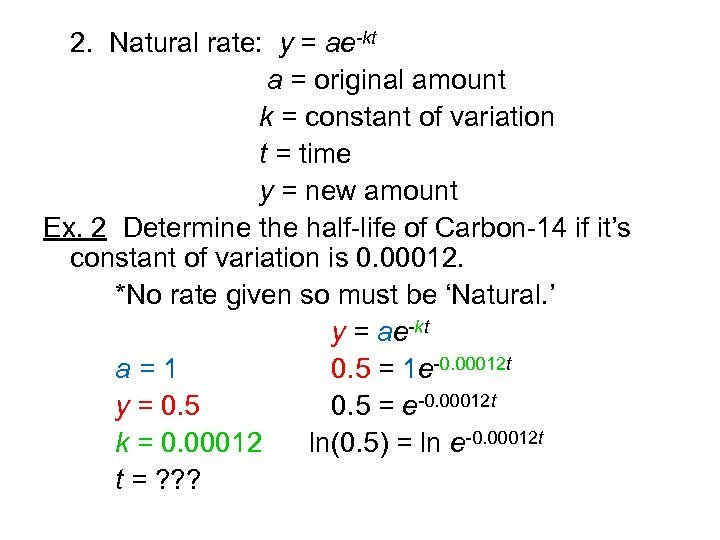 Natural rate: y = ae-kt a = original amount k = constant of variation t = time y = new amount Ex. 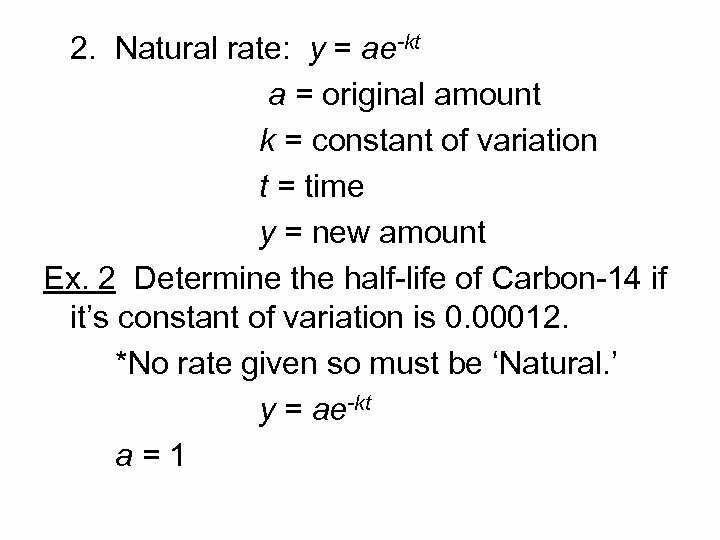 2 Determine the half-life of Carbon-14 if it’s constant of variation is 0. 00012. 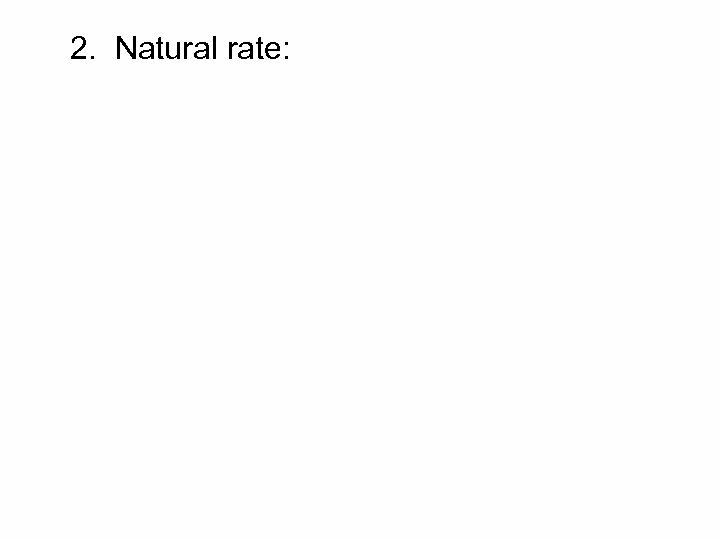 *No rate given so must be ‘Natural. ’ y = ae-kt a=1 y = 0. 5 k = 0. 00012 t = ? ? ? 2. 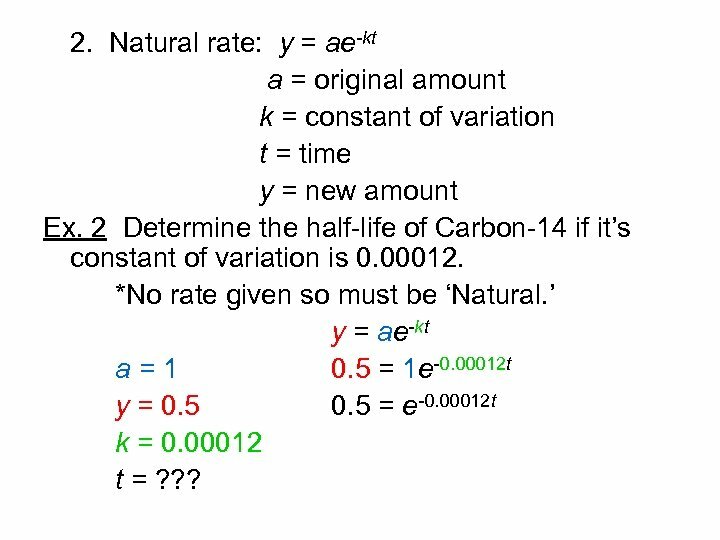 Natural rate: y = ae-kt a = original amount k = constant of variation t = time y = new amount Ex. 2 Determine the half-life of Carbon-14 if it’s constant of variation is 0. 00012. 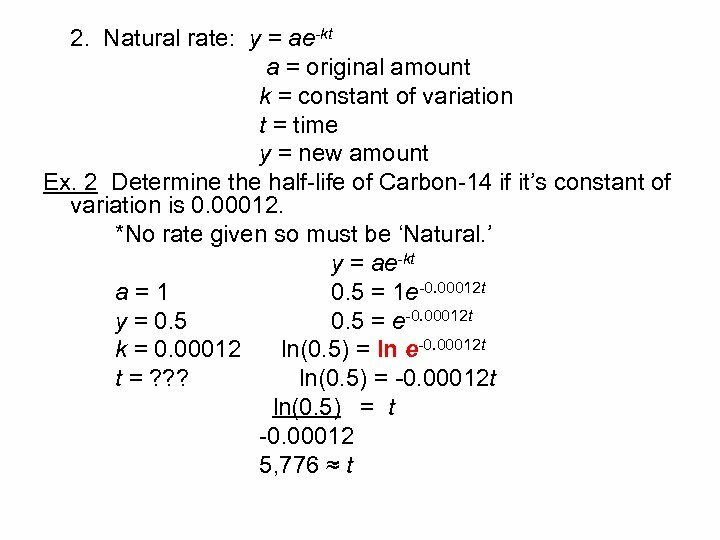 *No rate given so must be ‘Natural. 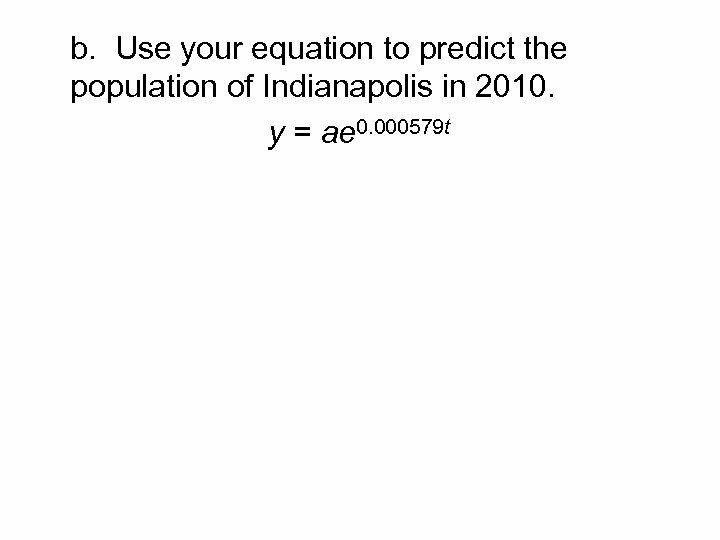 ’ y = ae-kt a=1 0. 5 = 1 e-0. 00012 t y = 0. 5 k = 0. 00012 t = ? ? ? 2. 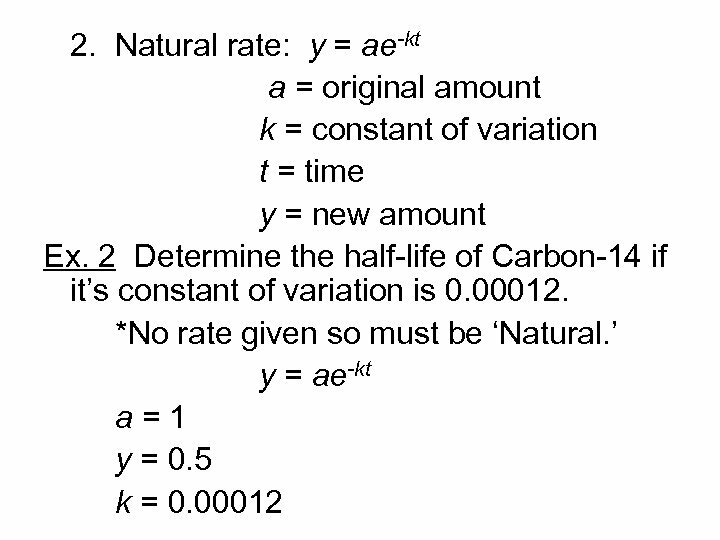 Natural rate: y = ae-kt a = original amount k = constant of variation t = time y = new amount Ex. 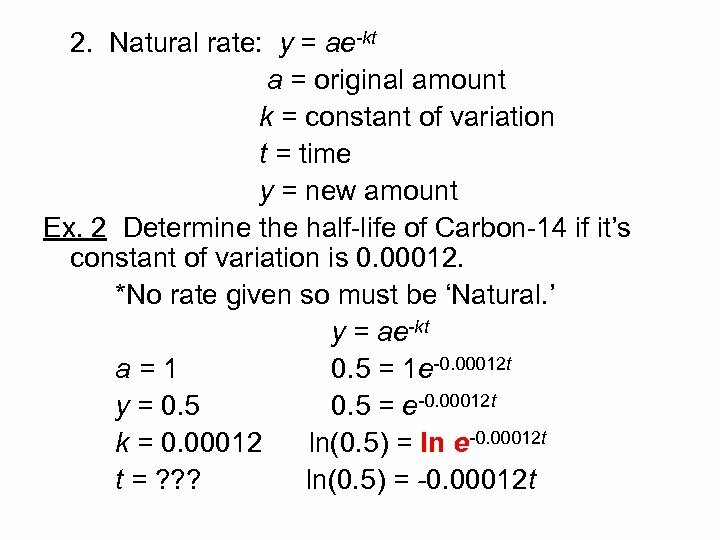 2 Determine the half-life of Carbon-14 if it’s constant of variation is 0. 00012. 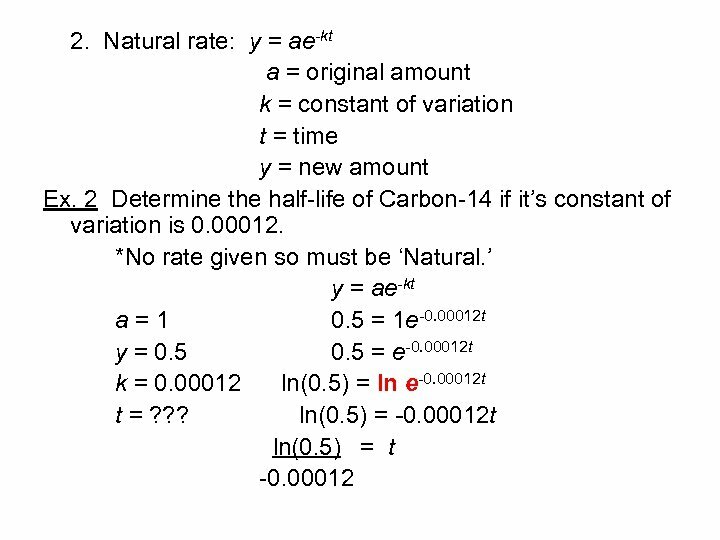 *No rate given so must be ‘Natural. ’ y = ae-kt a=1 0. 5 = 1 e-0. 00012 t y = 0. 5 = e-0. 00012 t k = 0. 00012 t = ? ? ? 2. 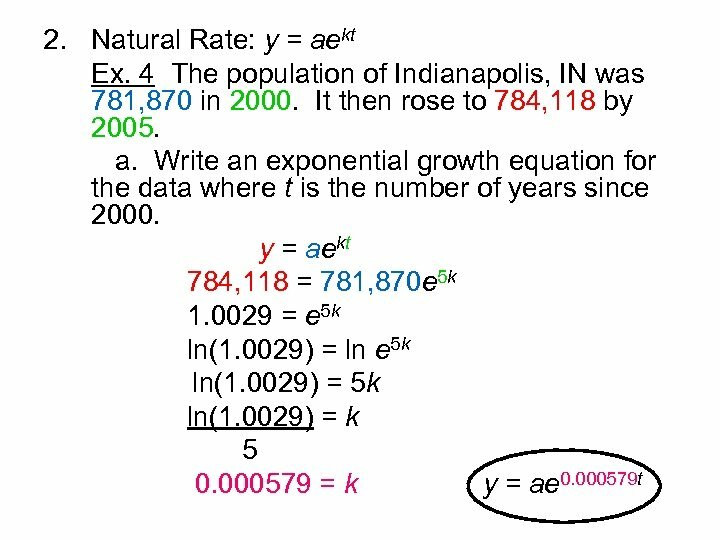 Natural rate: y = ae-kt a = original amount k = constant of variation t = time y = new amount Ex. 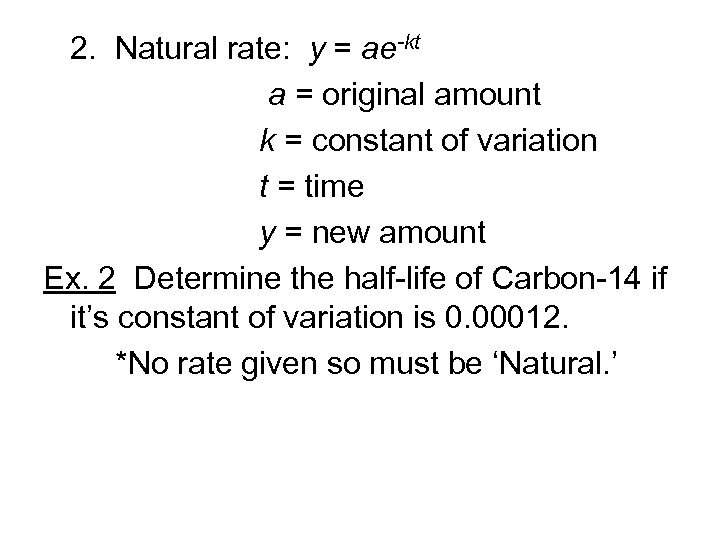 2 Determine the half-life of Carbon-14 if it’s constant of variation is 0. 00012. *No rate given so must be ‘Natural. 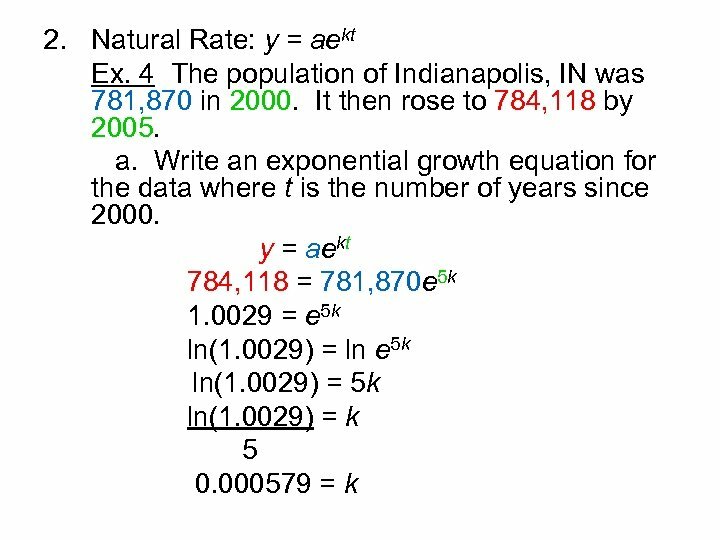 ’ y = ae-kt a=1 0. 5 = 1 e-0. 00012 t y = 0. 5 = e-0. 00012 t k = 0. 00012 ln(0. 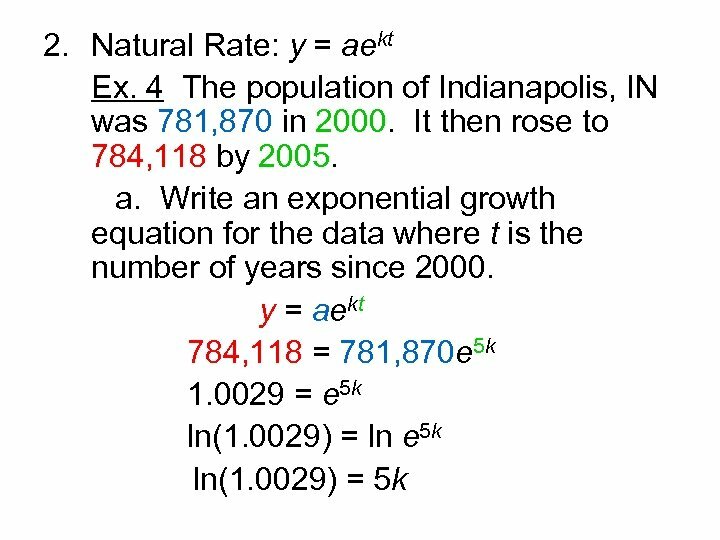 5) = ln e-0. 00012 t t = ? ? ? 2. 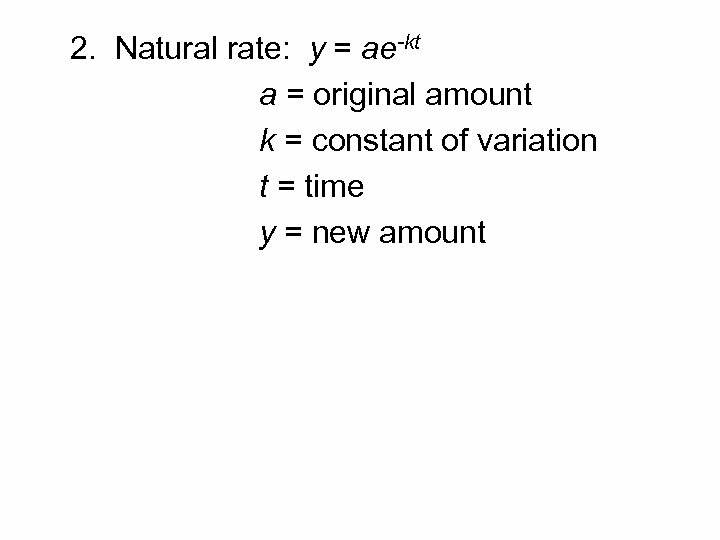 Natural rate: y = ae-kt a = original amount k = constant of variation t = time y = new amount Ex. 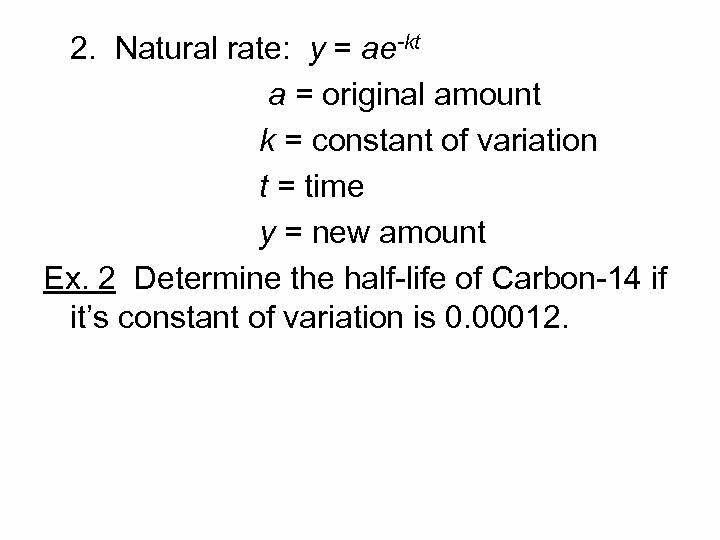 2 Determine the half-life of Carbon-14 if it’s constant of variation is 0. 00012. 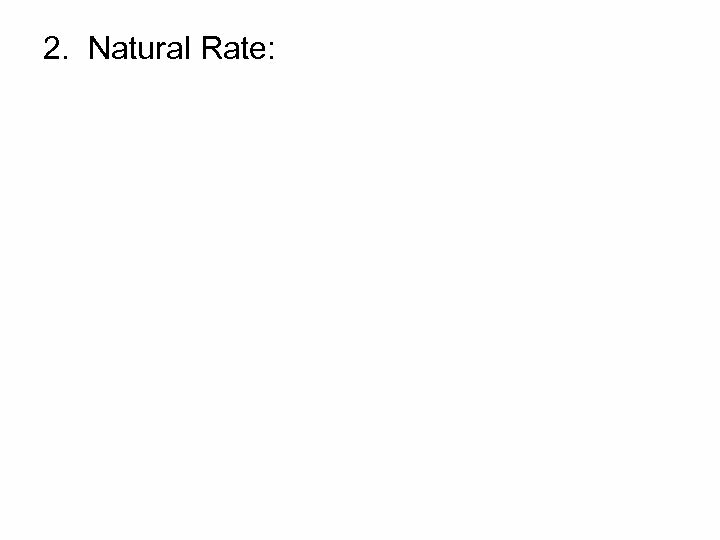 *No rate given so must be ‘Natural. ’ y = ae-kt a=1 0. 5 = 1 e-0. 00012 t y = 0. 5 = e-0. 00012 t k = 0. 00012 ln(0. 5) = ln e-0. 00012 t t = ? ? ? ln(0. 5) = -0. 00012 t ln(0. 5) = t -0. 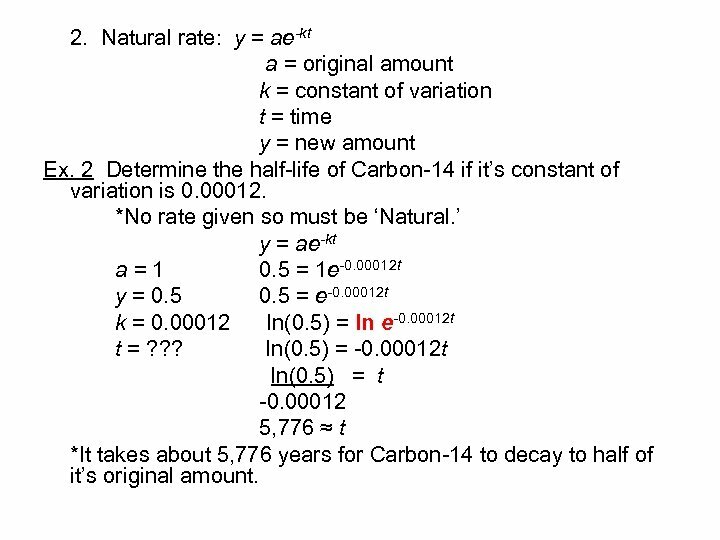 00012 5, 776 ≈ t *It takes about 5, 776 years for Carbon-14 to decay to half of it’s original amount. 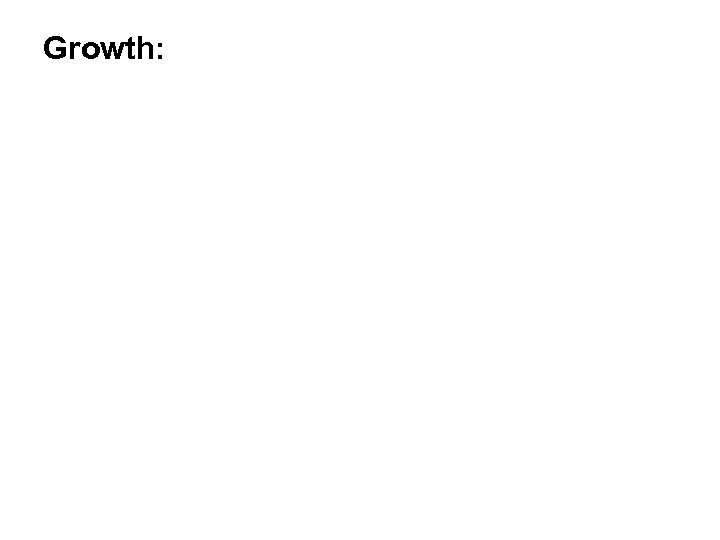 Growth: 1. 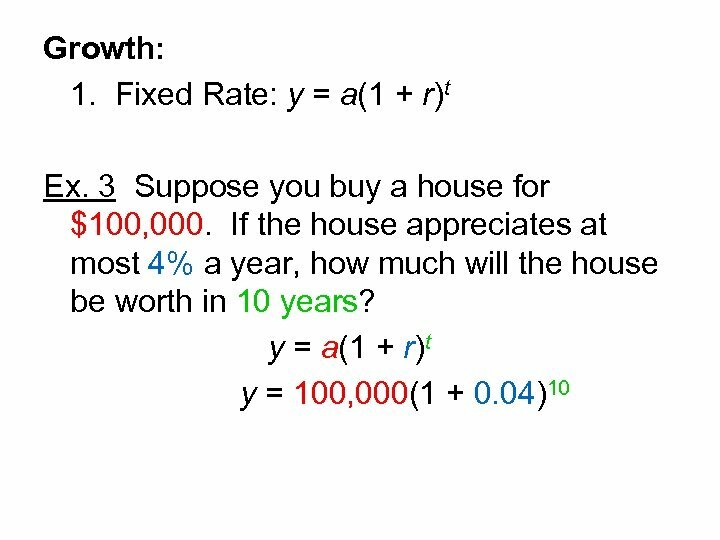 Fixed Rate: y = a(1 + r)t Ex. 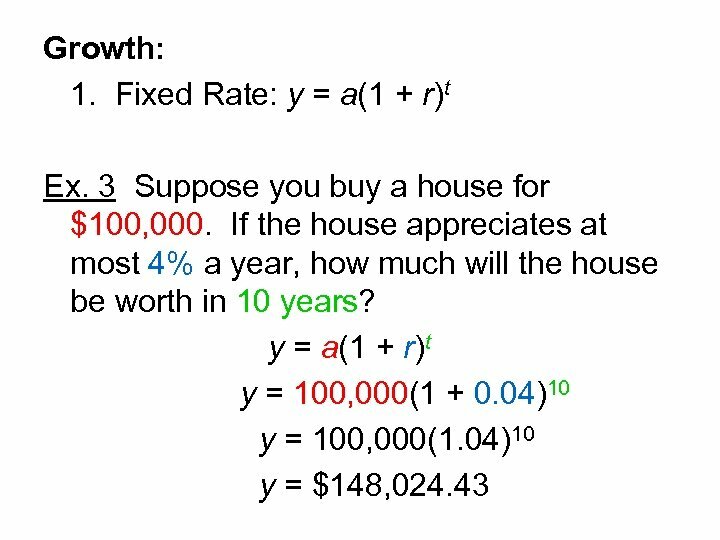 3 Suppose you buy a house for $100, 000. 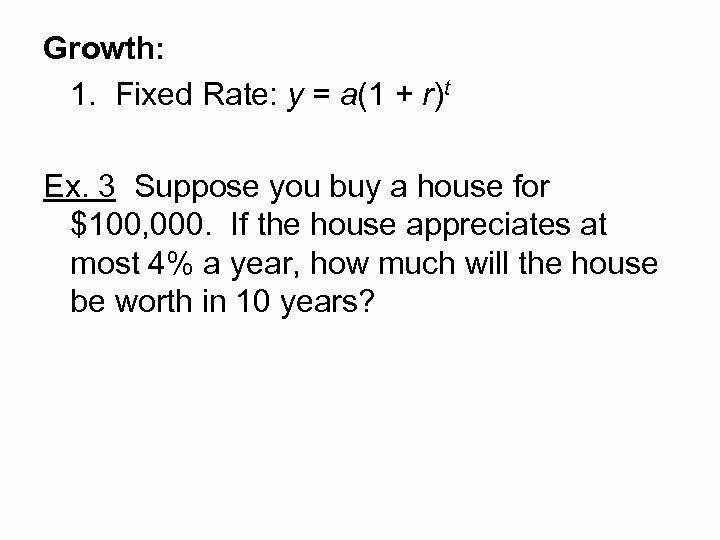 If the house appreciates at most 4% a year, how much will the house be worth in 10 years? 2. 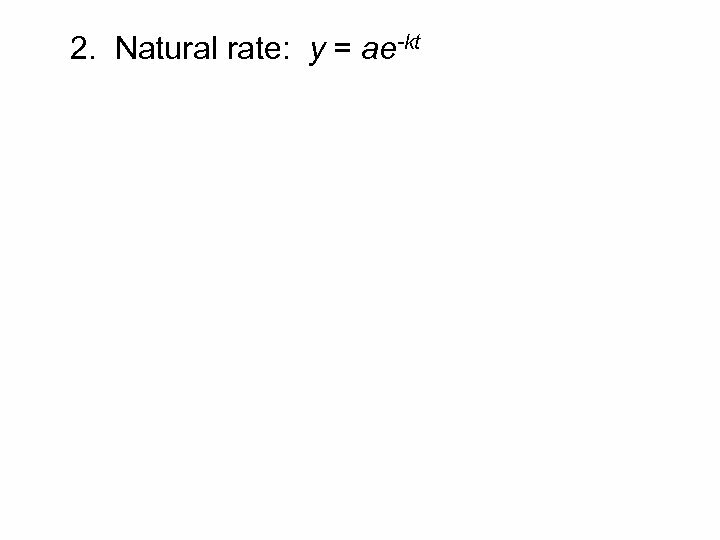 Natural Rate: y = aekt Ex. 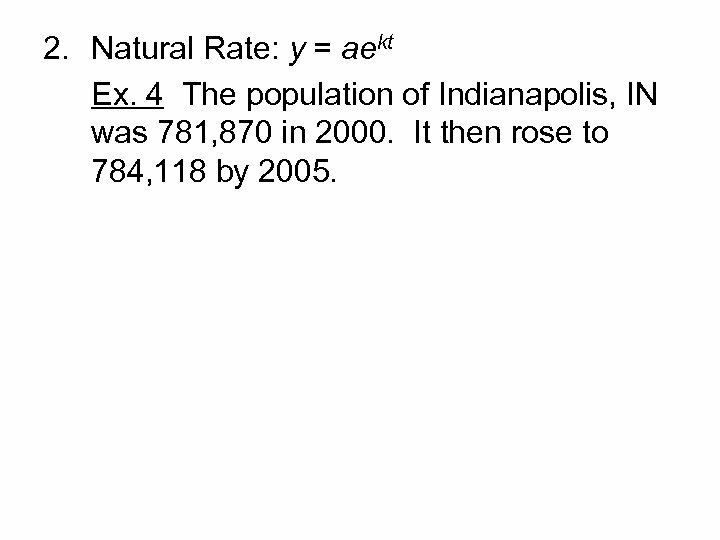 4 The population of Indianapolis, IN was 781, 870 in 2000. It then rose to 784, 118 by 2005. 2. 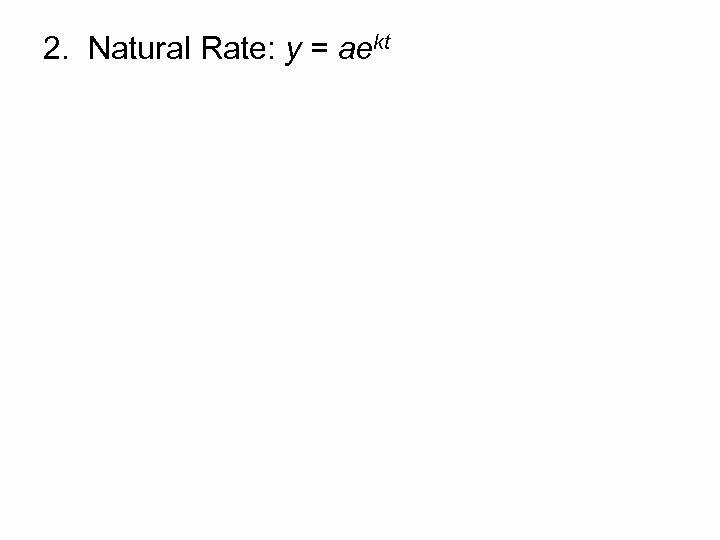 Natural Rate: y = aekt Ex. 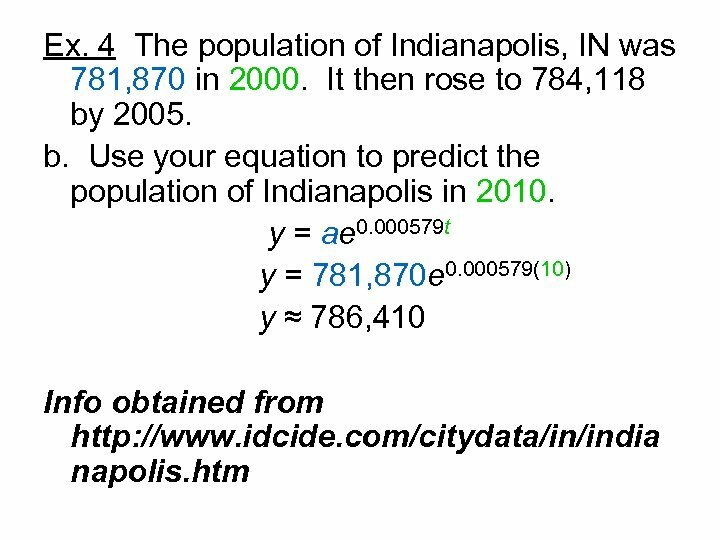 4 The population of Indianapolis, IN was 781, 870 in 2000. 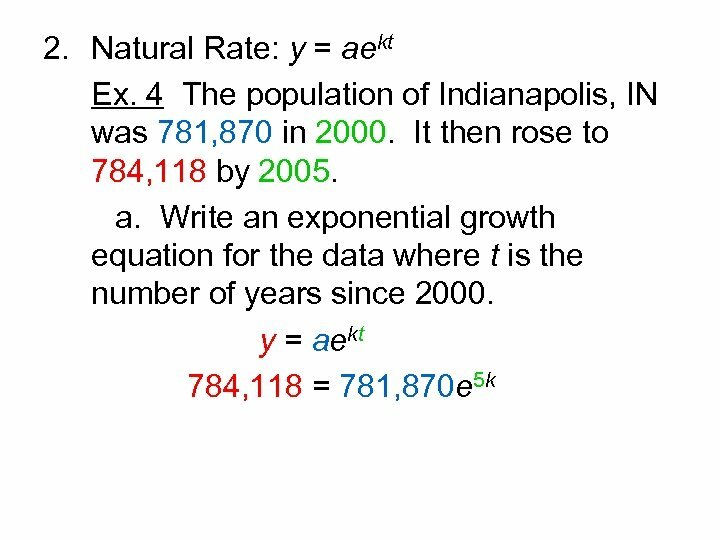 It then rose to 784, 118 by 2005. a. 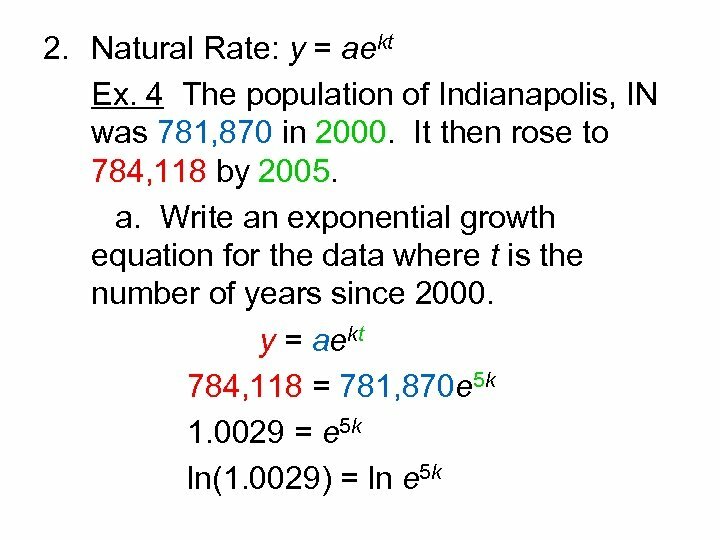 Write an exponential growth equation for the data where t is the number of years since 2000.
b. 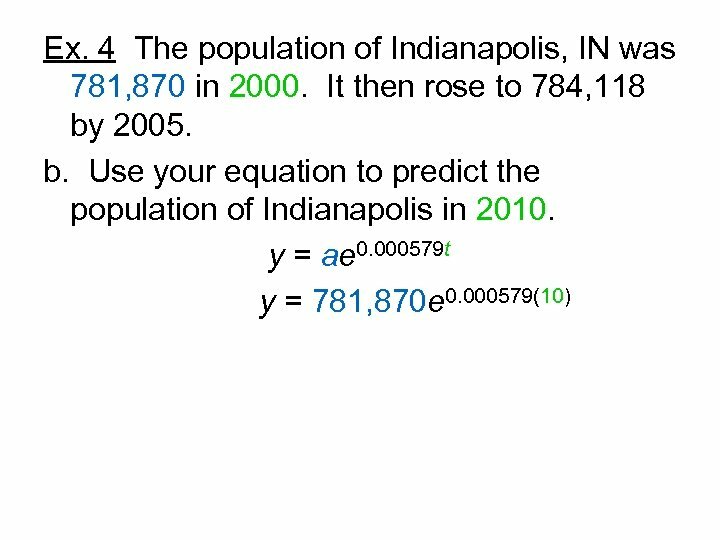 Use your equation to predict the population of Indianapolis in 2010.